Mark Cavendish has withdrawn from the Road Cycling World Championships road race with a respiratory infection. Cavendish, who has 23 victories this season, has also been affected by a crash to fellow Manxman Jonny Bellis, which left him critically injured. 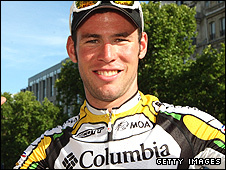 Cavendish, 24, had six stage wins in this year's Tour de France and also won the prestigious Milan-San Remo Classic. But his condition forced him out of the Tour of Missouri this month, and his place goes to Ian Stannard. Scot David Millar is set to lead the nine-man squad, which includes five riders who will compete for Team Sky in 2010 - Stephen Cummings, Russell Downing, Chris Froome, Geraint Thomas and Stannard - as well as Roger Hammond, Dan Lloyd and Ben Swift. Millar, 32, underlined his strong current form with victory in a time trial stage of the Tour of Spain last Saturday. Alejandro Valverde, the overall winner of the Tour of Spain, is one of the favourites for the world title, along with Italians Damiano Cunego and reigning champion Alessandro Ballan. Australians Cadel Evans and Simon Gerrans - who will ride for GB's Team Sky next season - Luxembourg pair Andy Schleck and Kim Kirchen and Belgian Philippe Gilbert are also expected to be major contenders.